I am thrilled to be able to help everyone begin their journey through Key Stage 2. 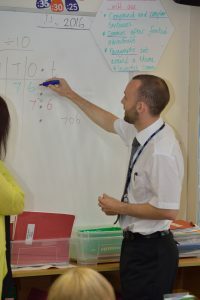 Over the past ten years of my career, I have taught across Key Stage 2 in Wolverhampton and Staffordshire schools. Having taught the current Year 4 pupils for the past 18 months, I have a good working knowledge of the new National curriculum so can prepare everyone for Year 4 and beyond. I’m an avid Liverpool FC supporter with a three year old son and 10 month old daughter. My hobbies include boxing for a local gym and playing cricket for a team. I also enjoy rugby league so go and watch St Helens play as much as possible with my wife’s grandad. At school, I used to love Art and Maths so enjoy all of the problem solving and investigations we can undertake in lessons! I never had a ‘Worst Subject’ but I really wish I had learnt how to play a musical instrument when I was younger. This year, we will investigate topics such as the Stone Age to Iron Age period, how and why volcanoes erupt, and a study of how the muscles in our body work. Hopefully, we will be able to welcome a real life Greek soldier into school for an Ancient Greek workshop, and also visit Birmingham’s Botanical Gardens in order to help us further our study of plants in science. Mrs Darrah will take the children for their French and violin lessons on a Thursday. PE will take place twice a week so please ensure your child has their indoor and outdoor PE kit in school every week. Homework will be issued on a Friday and handed in the following Thursday. Tasks will alternate between a maths and English focus along with weekly spelling activities and Talk Homework. Our classroom is right next door to the library so I hope to see Reading Journals packed full of home reading on a weekly basis. Both Learning Journals and Reading Journal should be signed every week by pupils, parents and myself.